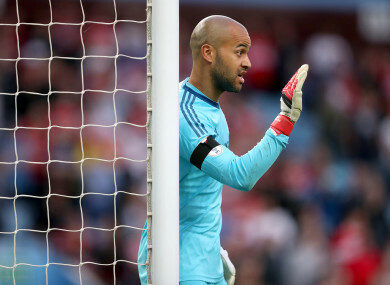 Darren Randolph has conceded goals in just one out of his side’s five Championship fixtures so far. DANIEL AYALA’S stoppage-time goal saw unbeaten Middlesbrough to a 1-0 win at home to West Bromwich Albion on Friday that saw the northeast side go top of English football’s second-tier Championship. Boro were on top for most of the match but had to wait until the 91st minute for a goal when Spanish centre-half Ayala scored from close range. Tony Pulis’s men squandered numerous opportunities against the manager’s former club with Martin Braithwaite shooting over the top from inside the six-yard box. Ryan Shotton headed over the crossbar and Stewart Downing had a strong shot well saved by Sam Johnstone. “It’s always lovely to score late on because there’s no time to recover,” said Pulis. “Ayala and Aden Flint will score goals. “I am pleased with the group, they have been in every day. Boro have now won four league games in a row after drawing their opening Championship match of the season, having suffered the disappointment of losing in the semi-finals of last term’s play-offs. West Brom, relegated from the Premier League last season, were far removed from the attacking side who beat Norwich 4-3 and hammered Queens Park Rangers 7-1 last week. The closest they came to a goal on Friday was when Boro’s Aden Flint struck an attempted clearance against the underside of his own crossbar. The Baggies also saw Dwight Gayle squander a two-on-one opportunity early in the second half. Defeat saw West Brom remain seventh after two wins from five league matches, with the bulk of this latest round of Championship matches taking place on Saturday. Email “Ireland's number one keeps another clean sheet as Boro go top of the Championship”. Feedback on “Ireland's number one keeps another clean sheet as Boro go top of the Championship”.